The bears finally showed a little bit of strength yesterday, although the decline was almost entirely retraced by day's end. Before I get to the short-term bear counts, I'm going to present the slightly more bullish alternate, then wrap up the discussion with the bear view. The recent decline is currently a three-wave form, and played out almost perfectly for the alternate count -- this is causing me to again present the alternate count's chart (not published yesterday; chart last published in Friday's article). It was brought to my attention that the very short term count I showed yesterday with the black "Alt. : A" and "Alt: B" labels wasn't understood by many readers. Those labels represented the blue a and b labels on the chart below. There's an interesting potential at play across markets right now. Last Thursday, the Dow Jones Industrial Average (INDU) came within 35 points of invalidating its entire Minor Wave (2) count. The current structure on the INDU appears slightly different than the SPX. 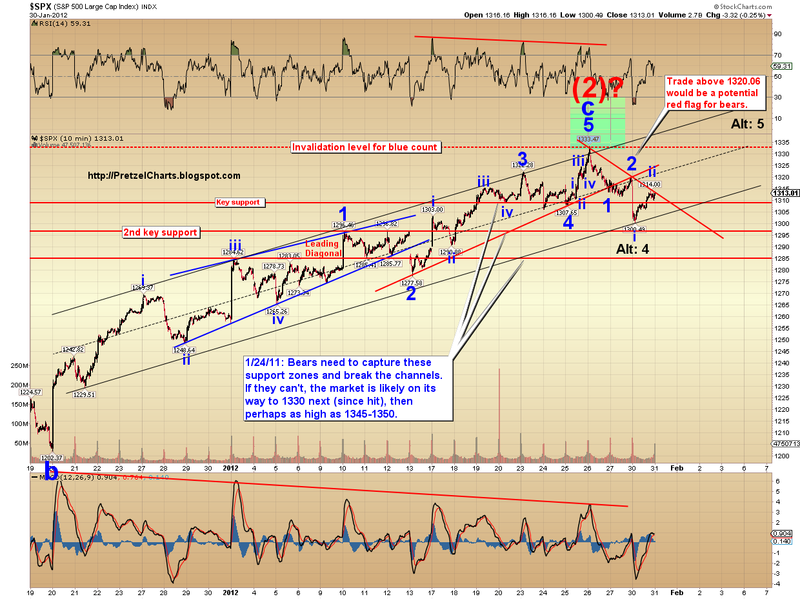 While the SPX looks like a 3-wave decline, the INDU may have formed a five-wave decline. The INDU also pierced intermediate support, though rallied back above it. 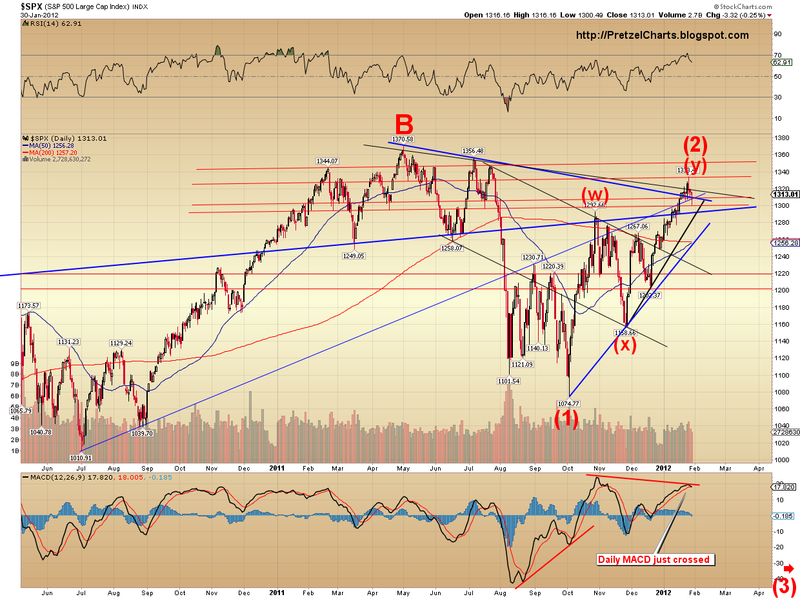 Is it possible that the INDU has topped, while the SPX could still make another run, slightly above the 1333 high? Today's action should help answer this question. Below is the INDU chart, which mainly focusses on the support and resistance lines. For the first time since the rally began, INDU pierced the rising blue trendline connecting the November and December bottoms. It still maintained the red channel, but each decline has been getting progressively stronger, as each time the channel line is forced lower. I expect the next decline will finally break the rally's back for good. In the meantime, until there is a solid close beneath the blue trendline, there is still no confirmation of trend change. The next chart is the short-term bearish count for the S&P 500 (SPX). Trade above 1320.06 would rule out the 1-2 portion of the count shown below, and cast suspicion on the blue 5 label, since that would force the entire decline to be viewed as a single first wave, which is difficult. Trade above the recent 1333 highs would rule out this count entirely, and shift preference to the alternate SPX chart. The final chart is simply a big picture view of support and resistance lines for the SPX. The bears still have their work cut out for them, though they do seem to be getting progressively stronger. Breaking the black channel in the short-term chart (shown above) is the first step, breaking the 1300-1310 zone is the second, breaking the rising black trendline in the long-term chart (shown below) is the third, and breaking the rising blue trendline below would be final confirmation. It is noteworthy that the daily MACD has finally crossed over. It has also formed a negative divergence with price, and barring a big renewal in the rally's strength, this is often indicitave of a pending decline. In conclusion, whether I nailed the top yesterday remains to be seen. I'm not backing off that call yet, but there was nothing yesterday to add any confidence to it. However, even if the market moves slightly above the 1333 price point, the rally is now showing signs of weakness. Each decline has gotten stronger, and each time it's knocked out the next lower channel support. MACD has finally crossed, and I suspect that any upside potential is now quite limited. Trade safe. Somewhere I need to (again) cover the fact that Minor Wave (3) isn't likely to start off as a series of monstrous declines. It's likely to start off as a prolonged march lower in wave 1 of (3). The serious crash wave isn't likely to hit until 3 of (3). The "flash crash" stuff was Anon20 talking, not me. While that's always possible, it's a lot less likely than a decline that starts off less violently. I've covered this several times previously, though haven't lately. Absolutely agree, look to charts to see what is coming, anything like a Flash Crash is not there yet. IMO direction has switched to down, one can verify this by looking at DAY charts. Here is the $TRAN, one of the two one should look at for general direction; the other is $RUT and I admit, it is a mess, I can get nothing from $RUT's chart. IMO $SPX and $DJIA are not what to look at altho I do. Transportation provides a view of the fundamentals for growth in our country in the form of shipping (and Baltic Dry for importing, I disagree with some that it is not a valid indicy at this point). But doing my scan of 250 charts each weekend, I found few stocks (very few) with potential for up and many set ups pointing down. Trannies entire rally is completely uncountable on a 10 minute. Chart's a huge mess of overlap. Good Morning Pretz, thanks for the reminder on this. I know you have mentioned this several times in the past. I have to admit I am one of those who thought I will be ready for a big overnight gap down and a major fall during the day. Now I realize that this would not be the case. That the decline would be gradual. I will plan ahead around this. D.
Thanks Katzo...I followed $RUT yesterday setting the day's TLs at the open an then at 1000. It was actually really tradable, but thats about it. The MAs do seem to show the twinkling of a rollover on a weekly basis. watch 8:30 am. watch AAPL today. . . AMZN earnings after bell, charts say a miss. Will be a bit of a surprise to me after Christmas season tho. Forward guidance? New highs and lows should be confirmed by the other. 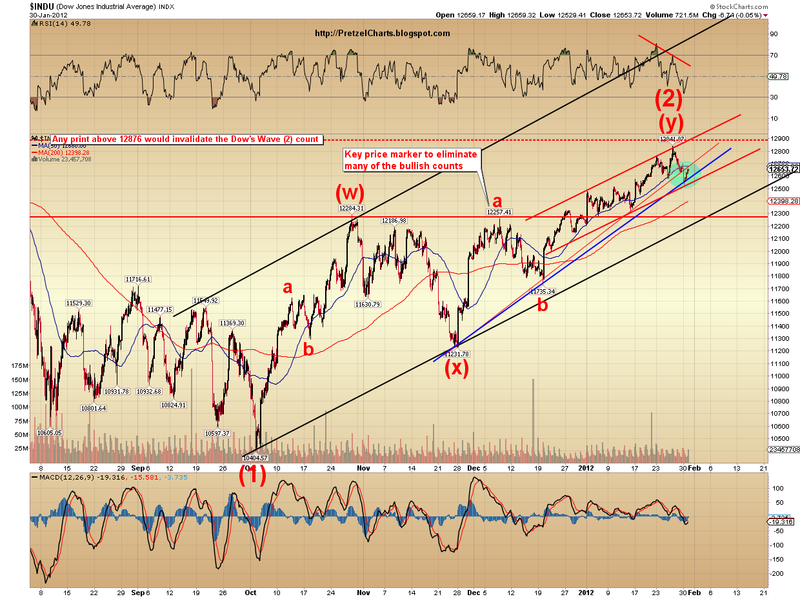 Divergences suggest a pending trend change. btw, I check the trannies every night. Take a serious look at a 10 or 30 on that index, though. Absolute mess. I have been looking at the 08 decline in your long-term chart to get a sense of the timing for the decline in the works now. That perspective has helped me recognize the need to be patient. I don't use or understand EW, however, I find the site facinating. However, the current pull back looks very orderly to me with volume kind of low and price fighting back throughout the day. There's not too much for the bears to get excited about based on the price action. Case Shiller worse than expected, down .7% for November. . . nail in coffin? so are you buying or selling? Earnings expectation is very, very low for AMZN compared to same quarter last year--they may make it. A lot of the iPads sold in Q4'11 were through Amazon because of no sales tax. If the bears do good work today, VXX should hold above prior low of $25.97 and we may have double bottom for VXX. There will come a day when the MSM can't say it's "priced in". Good morning and good job! That's tough to read, butitsevenhardertoreadwithoutspaces! :) Backward, without spacing...forgetaboutit! Yeah, but that day is already priced in. Based on price action, Chicago PMI must have missed? Yes. 60.2 vs 63 consensus. watched Bloomy this morn, all analysts bullish. Contrarian Indicator that also leads the way. If consumer confidence misses at the top of the hour then it will be 3 out of 3 misses today! bot doesn't understand the words 'are you sure.' Bots only compute data. Now... Consumer confidence at 61.1 vs 68 consensus. Vs. 64.5 last reading. "US Conference Bd Jan Consumer Confidence 61.1 Vs Dec 64.8 "
Be careful... VXX is heading higher quickly. $RUT broke down out of it's channel nicely. Trade your charts, nothing else. Mentioned tgt was 07.5 ES, hit it. avg in 12.5 ES. holding til EOD. Any questions about a right shoulder now? no, so many better things to do, then short aapl today. not convincing enough for me. bots don't understand Elmer Fudd. A former President? It's easy to read when you have dyslexia. Yes. They are trying to hold out for that "just a little bit more..." but have their eyes on the exits. If we close lower today, it'll be 4 in a row. Then, if tomorrow's ISM manufacturing misses, it will likely turn into a small stampede for the exits. Being the fist of February, that would be a bad sign since 1st of the month usually brings inflows to the market. Any thoughts on "Trade above 1320.06... red flag for bears" from chart 3, since it hit 1321.41 shortly after open? Maybe I'm mixing short term and intermediate term relavence, so possibly someone has a clearer take on the impications. The Chicago PMI index is released 3 to 5 minutes before the official 9:45AM release time to paid subscribers. I learned this the hard way. Follow up chart, searching charts for a bull flag that was mentioned earlier? Katzo, check out 120min ES, looks like a larger H&S forming now. Neckline 1300 ish. PL generally isn't concerned with a brief move above/below one of his price levels. The exception being if he says to watch for a whip saw movement. you guys just witnessed an EW4 on the 120 ES being put in (lights blinking, numbers crunching) and consequently the right shoulder. predicted this all nite, this was a classic fall away into the EW5 ES 120 down move. seen this many times. draw in the bulls, hang a bunch of paper on them. I seriously no one was drawn into that, been 'verbose' (well, as much as a bot can be) all nite. also hope no one traded my entries, awful ! the worst i have ever done (for a bot). but I will get out with a good profit. Your a good bot :) But you need to update your name to Katzo7000 with all of your upgrades. Very possible with all of the subsidized Kindle readers they sold. Revenue should be huge, though. So the question is how will the street view the results? Quite the reversal there. Looks like there is little support till 1300?? Lets see if my little "amateur" observation does play out the next couple of days. VIX up 10-20% coming?? For Katzo: The 3 Fruit Loops and a Toucan pattern (3FLT). Call me whenever you need the big guns. Great chart and pic. Bring a smile to my face. Looks like someone(s) read PL's article and programmed the BOTs to 'grab' all the short stops between 1320-1321.5 SPX cash market. Maybe you could start a new service: "Fun charts to teach your prepubescent to trade... Now enrolling kids aged 5 through 10. Sign right up..."
Thanks for the reminder, PL. Because I don't day trade (yet), all investment vehicles are on the sideline in Money Market, Stable Principal, and Bond funds (slight exposure to US Treasuries as I am anticipating a flight to USD, which has already started to happen IMHO). Watching. Waiting. Learning. The helium pumps are working well. I am sure there is a market for these charts somewhere..pun intended. Are you net long or short at this point? I'm not clear from your posts. I don't know what you mean by "out for the day" because with "stops in" you can't be out. You still don't have the golden cross you were toot'n about. I'm talking about the spx. Dji is heading down, will probably lead spx down. I think my 3pdh is going to kill your golden cross. Or, and this will be sweet, you get your golden cross, for a total or 3 days, ending friday. There are such things as fakes, you know. What's your position, and what's your target(s)? a perfect bear flag would roll over right here.....completed fib 38.2 retrace, rsi & stochastics overbought on several time frames....will the market comply? I just went short a few ES contracts. Yes. This is a critical juncture for the correction to this morning's down move. Thanks for the update! It really helps when other eyes detect things. I went short at this level a while back (too early). my 5 min parabolic sar just signaled sell, we're coming out of the trendline. If technical analysis is good for anything, this thing drops very soon. slap upside the head just as badly as Europe does. so you think we're going higher? got a target? I'm guessing break with target at 1293es. It's gotta do it in the next hour and a half though. From 15:11, I expect a rally to close. you might say, we hit 08 katzo, wtf? sometimes I count the candle wicks, sometimes not. Body of candle on the 120 is actally 06, provide a point or two leeway. Or if not enough downward momentum, target 1299. But only till 15:11pm. bear flag on the 15, cautious but think EOD lower. . .
just hit 61.8 retrace of the flag...could bounce a bit here, but how much? taggin fibs the whole way, breakdown just retraced 38.2, hasn't fallen away yet, but it slowed a bit. I think katz is abreviating: "back test of 1305 on S&P futures"
hey its never too early to get into the life boat. thanks, have to keep reminding myself, he is in futures and I think cash. Don't make the mistake of attributing humor to bots. They're just reporting. It would be nice to see 1310 become resistance instead of support. where we going, up or down? what happens at exactly 15:11? also, since January was a good month anyway, is window dressing necessary? also, window dressing does not take place everytime, does it? yikes...backtest of the flag now? after a full 61.8 retrace? feels like higher now. A lot can happen in an hour - till 15:11. ATM, just sideway churn. But at 15:11, I will keep close eye on price action. If there is strong downtrend at that time, then from 15:11 to close may be drop. But if not decisive, then I will play as if 15:11 to close will be rally. The specific time is from Flux doing data mining on past 60 days. It reflects the action of bots. I was born on the 12th of July which is .529 of the way into a calendar year. My son weighed 5.94 lb. at birth but is now 38.2 times that weight. If you multiply my son's birth weight by my birthday, the result is 'pi'. So based on that incredible coincidence I'd say the Russell is about to freaking tank someday. It's all about logic man. btw, I bailed for a small gain. And Aristotle said, if you give him a lever, he can move the earth. Just math. if anyone has a mortgage refi ASAP (in Feb.), you will never see rates like this again. told my mortgage broker in Sept. i'd be talking to her in Jan or Feb. I am callin you ARock forom now on. You are missing the point, what are g.f.s measurements? Even a bot has to live vicariously. Women and children? might be best to keep a few onboard...you know to do the rowing. probably going to lose this stop...123 reversal off the AM low so probably higher till 3:30 before a fall back to flat close. High and low of day are in IMHO. katz, taken your profit yet? If not, it has a potential to go up to 1311.75. It's all about the injection of a little bit of <a href="http://stockcharts.com/h-sc/ui?s=IWM&p=1&b=3&g=0&id=p95859571779&a=250041884&r=1681&cmd=print'>inspiration</a>. Those upgrade were totally worth it. Based on your calculations, I would say RUT tanks sometime between now and friggin eternity. And don't forget that tomorrow is Opposite Day. Whatever you think will be down will be up...or is it Opposite Week this year in celebration of Greece's 100th bailout rumor...oops correct that...101st. aud.usd suggesting otherwise, still hasn't made a new high from the initial flag....but it still feels like higher though. for real....123 just now, can we take out 1304 ES???? that would be tasty. Well, at least VIX is not faded. Ben is just making the crash that much better...uh...I mean worse. :) Do ya think he'll call his buddies right before he pulls the plug as an effort to increase "transparency"? A lot of people are wondering why stocks are rising today. It's because the markets are open. That's why. should be a very big down candle soon. . .
and when you say "bad" do you mean down or up? i would consider up "VERY BAD" at this point. as it breaks my 06.5, it keeps on hammering away at it. . . Tomorrow is ADP job report. Yeah, that was Aristotle Onassis, back in the day when he was a wealthy shipper. He was feelin' a bit cocky. based on charts, of course. . . Anybody know where we are now, wave wise? this market doesnt care about charts... if we go down its on news at ths pont. persistent bid, persistent bid, chant it over and over! I am not sure the market is as efficient as it once was. Underwater is not a problem. There's a government program that backstops the lender, by way of new underwriter called "Ginny Mae". The bank wants you to refi so they can lock out the risk and lock in the profit. If you don't refi, they are at risk of you walking out and away. Possible short also if we the ascending TL does not hold. ?? I don't see the collapse. I see a normal size down bar. And it's approaching bottom BB. bottom of candles measure 1299 to 1300 ES on the 120 before the bounce to build the right shoulder. i am expecting the mrkt to go down and either break thru that or at least test that level once again. Today or tomorrow, cannot tell time. As they say, you either get the timing right or the level but rarely both. this is an explanation about my possible BAD DAY tomorrow, if we do a clean break of 99-00 than we will really drop to my lowest level posted i think. Dontcha just love the "free" market. watch. . . . .
unfortunately that is an parabolic that keeps on rising because of the Twinkies you eat. Bot humor..
Nice call! What made you predict that? For what it's worth, I'm bearish because we can't seem to close back above the 10dma (at least not yet!). i want you to take a 5 minute chart and draw a horizontal line at 04.75 ES and another at 02.75 and watch the candles pound away at those two levels, today or tomorrow. I just made it tooooooooo easy for ya on that one.